21,265 (July 2015 est.) $262.6 million (2015 est.) $14,800 (2015 est.) Tourism, financial assistance from the U.S. Six island groups, totaling over 300 islands in the Western Pacific Ocean Constitutional government in free association with the U.S.
Palau is an archipelago of more than 300 islands in Western Pacific Ocean, part of the Micronesian region. Palau’s population relies on tourism, government jobs, and subsistence agriculture and fishing as the economic base of the country. Palau’s expansive geography, small markets, and tourism-based economy make it vulnerable to climate change impacts and extreme climate events. Outside influences, from Spain, Britain, Germany, Japan, and the U.S. have operated strongly in Palau in its recent history. After three decades as part of the UN Trust Territory, Palau became an independent nation in and entered free association with the United States through an agreement approved in 1986 but not ratified until 1993 due to its unique anti-nuclear clause. Palau depends heavily on its marine-based resources, such as coral reefs, for livelihoods, economy, and culture. Coral bleaching is becoming more frequent as the ocean warms. Increased bleaching, sea-level rise, changing ocean chemistry, and other climate stressors will negatively impact coral reefs, fisheries, and other marine-based resources. The Rock Islands Southern Lagoon in Koror State, Palau, has been designated a UNESCO World Heritage Site. Numerous limestone islands surrounded by a complex coral reef system form a unique environment. The area also hosts important historical sites of stonework villages, burial sites, and rock art. Photo ©Lux_Tonnerre, 2008, used under a Creative Commons Attribution license. In the dry season, drought is sometimes a problem for Palau, and can become acute during strong El Niño conditions. The Western Pacific Monsoon is active in Palau and typically brings heavy rainfall between the months of June and August. Water rationing; however, has been implemented in times of prolonged drought during the dry season. As for other Pacific Island nations, sea-level rise threatens vital infrastructure, settlements, and facilities that support the livelihoods of island communities of Palau. Sea-level rise combined with storm surge from a tropical cyclone could mean serious and costly damages. Prompted by an ocean-warming event in 1997-98 that caused a massive coral die-off in Palau, the government has recognized the country’s reliance on climate-sensitive sectors and has pursued climate assessments and adaptation strategies as well as marine and coastal conservation measures. One such activity, the Micronesia Challenge, has combined the objective of adaptation to climate change with ecosystem protection. The Micronesian Challenge is a commitment by Palau, the Federated States of Micronesia, the Republic of the Marshall Islands, the Commonwealth of the Northern Mariana Islands, and Guam to preserve natural resources, and to collectively conserve at least 30% of nearshore marine waters and 20% of terrestrial natural resources by 2020. A leader of the Micronesia Challenge, Palau has designated 80% of its marine territory a marine sanctuary, in which the waters are protected by law from fishing and other uses such as drilling for oil. Palau acknowledges that one goal in issuing these protections is to increase the resilience of the ecosystems to climate-related stressors. 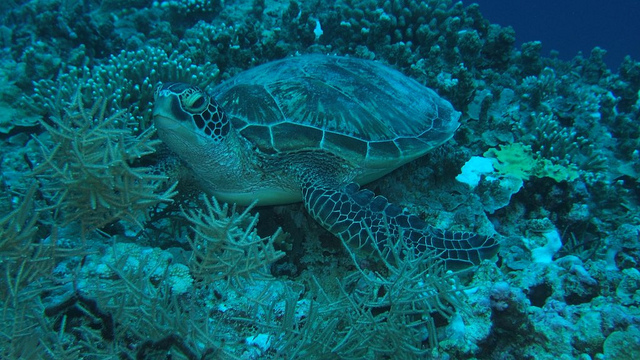 “Turtle, Palau,” ©Stephen Masters, 2011, used under a Creative Commons Attribution license. Palau launched a Climate Change Policy and Action Plan (CCP&AP) process through 10 sector-based working groups in 2014. Government agencies, civil society and the private sector worked to create a national vision and policy for action on climate change. The Palau Climate Change Policy for Climate and Disaster Resilient Low Emissions Development was formally adopted by Congress in early 2016.